I am a student at Rhodes University currently doing my honours in Marine Biology. I completed my undergrad at UJ in Zoology and Human Physiology and I must say, Marine Biology is possibly one of the most soul filling subjects you could ever do in my opinion. I am working with the size, biomass, consumption rates and population distribution of the spiny starfish (Marthasterias glacialis). Not to mention that we are also looking if a relationship exists among M. glacialis and the invasive Mediterranean mussel species (Mytilus galloprovicialis). A mouthful I know, but it is one heck of an experience. Figure 1: Daniela counting spiny starfish collected for measurement. These starfish are pretty easy to spot with their bright orange (sometimes maroon) colored bodies and their characteristic non-poisonous spines that offer protection from predators and in this case, honours students trying to do research for their projects. They are often found feeding near mussels and have thousands of tube feet on its underside of its body that have one of the strongest suction strengths. They have a hard time letting go… of anything. I’ve learnt to be really good at sneaking up on them before they have a chance to lock onto structures, don’t be fooled though these creatures are just as sneaky and are capable of squeezing through anything. The longest arm was used to measure them and a balance was used to determine their mass and it can be a long process, but it’s a good thing they aren’t fast. 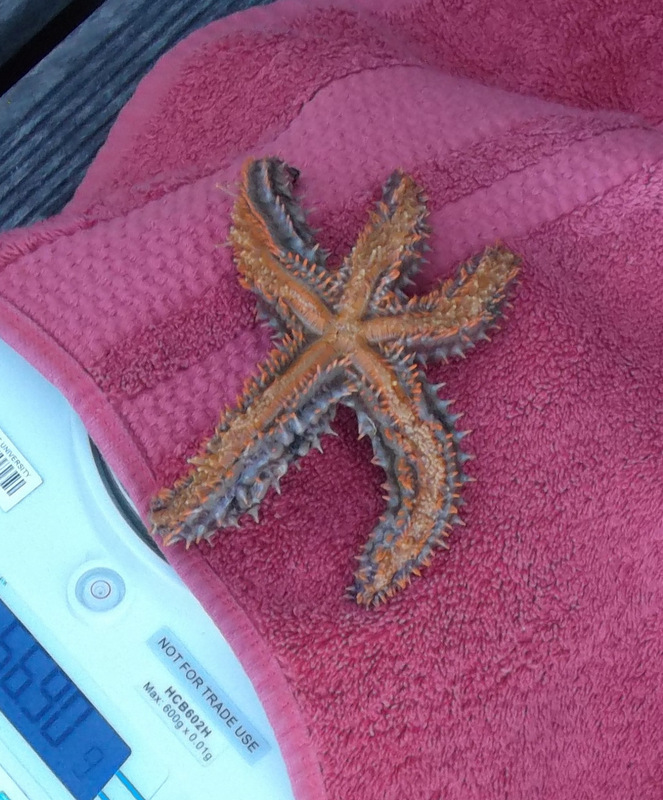 Figure 2: Spiny starfish counted and measured by the Knysna Basin Project post graduate research students. This experience has also taught me not to underestimate the ocean and what it is capable of. I overcame my fear of cement structures that are submerged in water as well as being near boats while in the water, I even managed to get a spontaneous 20 minute hands on tutorial on how to operate a small boat. Figure 4: Daniela examining the spiny starfish. However, I couldn’t have accomplished all this without the help of my team Nina de Villiers, Carla Bint and Louw Claassens who are all working with the Knysna Seahorse. Keep an eye out for them! I wouldn’t take back any moment working within this field. It has been such a highlight learning about these animals and all the others that I have encountered and each time I go out into the field it reminds me of how much needs to be protected and conserved. Guest post written by Daniela Maia, a Honours student from Rhodes University.